Henry Ford had the right idea when he began manufacturing Ford automobiles in 1903. Ford is a dependable and steadfast automaker that offers a generous selection of cars, sedans, trucks, and SUV’s. 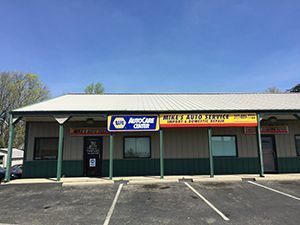 Here at Mike’s Auto Service, we appreciate the quality and assurance that Ford vehicles offers drivers, which is why we offer drivers high-quality Ford service and repair in Greenwood, Indiana. Our ASE certified mechanics have the experience, knowledge, and technologies to accurately diagnose and service any model Ford, whether an F150, Ford Fusion, Ford Focus, or other model Ford. Get professional car maintenance, brake service, engine repair, air conditioner repair, and much more, for a fraction of the dealership’s cost! As a NAPA® authorized auto care center, we guarantee to treat your Ford as a top priority. We use all NAPA® and OEM auto parts, and the latest advancements in the automotive repair industry, to render high-quality results you can trust. Complete customer satisfaction is most important, and for us, that includes providing expert service at economy-based prices. When you need Ford repair services in Greenwood, let our professionals get your vehicle operating smoothly and safely again! Call 317-889-7722 to schedule an appointment today.